Whether you’re collecting donations for a worthy cause or just encouraging your family members to save money, these striking banks will catch everyones eye. Large cavities hold lots of coins. Designed with a removable plastic plug for removing coins. Plan includes FULL SIZE patterns for all three projects pictured. Order hardware parts separately or see Special Offer below. The 4264 Special includes plan and hardware listed (side plates, screws, plug, eyes and decal). 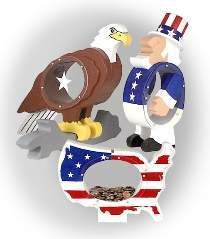 Each patriotic coin bank uses two #8605 Side Plates, #PR124 Round Head wood screws, and one #3295 Coin Bank Plug. Optional accessories include two #8866 Yellow Eyes for the eagle and one #4153 White Stars Decal. Decal has enough white stars to decorate the three projects as shown.